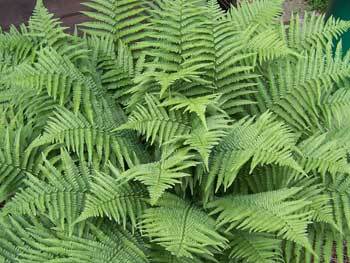 Male fern is a perennial semi-evergreen plant; the dark brown scaly rootstock produces a tuft of fronds which are curled spirally when new but open and mature to a height of 9-24 inches. The fronds are broadly oblong-lanceolate to oblong and pinnate, the lanceolate-acuminate to oblong-lanceolate pinnae themselves pinnatifid or lobed more than halfway to the midrib. Spore clusters appear as two rows of yellow dots on the bottom of each lobe from July to September. Found in woods, ravines, and on rocky slopes all over the world. In the United States, most prevalent Maine, Vermont, New York to Michigan. Aspidinol, albasidine, phloraspine and filicinic acid. 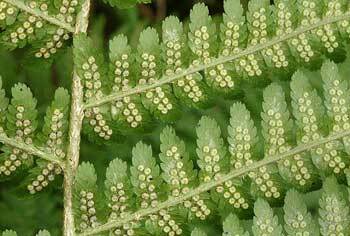 In the Middle Ages people made a good luck charm out of the rootstock of male fern. They cut off all but five of the curved finger-like fronds from the rootstock, so that it resembled a hand. Called Lucky Hand, Dead Man’s Hand, or St. John’s Hand, this charm was considered to be very strong against bad luck, devils, and witches. It was usually fashioned on June 23rd, St. John’s Eve, so that it would gain extra potency by being fumigated in the fires set that night. Genghis Khan is supposed to have carried one of these charms. Male fern is an ancient tapeworm remedy, dating back to the Greeks and Romans, but it must be used with great care. Leaving a male fern medication in the body too long can cause poisoning, so that one to two hours after taking it a purgative (like castor oil) must be used to remove both the worms and the remaining active ingredients. No alcohol or oil may be taken while male fern is being used, as they would increase the absorption of the toxic principle. Source of oleoresin used to expel tapeworms. It stuns and paralyzes (without killing) tapeworms, round worms, and hook worms. Good for sores, boils, old wounds, swollen glands, diseases of the spleen, rickets, and epidemic flu. For external use, a decoction of the rootstock can be added to a footbath for varicose veins. In European folk medicine, a popular belief is that sewing the fronds into a linen bag and applying to affected parts will help rheumatism. At least, it does no harm. Since proper preparation and dosage are essential, use male fern for tapeworm only under medical supervision. Decoction: boil 1 lb. rootstock in water and add the liquid to a footbath. Toxic poison and skin irritant. No alcohol or oil should be taken during treatments; they increase the absorption of the toxic principle. Improper dosages taken internally can lead to blindness and death.